I think it's a fairly well known fact among my readers that I'm a huge fan of Burt's Bees Lip Shimmers & Lip Balm. Yet, there are several of their products I haven't tried, but would like to. Especially after reading some of the testimonials. For example, this is what one lady said about their Citrus Facial Scrub: "I have been converted to your facial care products! I have had horrible skin for years...I was always breaking out and I tried every prescription medication I could get. I started using the Citrus Facial Scrub last month and in days my skin cleared up! It looks and feels healthy. I have been telling all my friends. Thanks!" Another lady had this to say of their Moisturizing Night Creme: "About 7 years ago I committed myself to cruelty-free products and have been paying a FORTUNE for stuff that kind of works, doesn't work, causes allergic reactions or just plain smells bad. Oh, how I wish I had some of that money back so that I could turn around and invest it in your products, particularly your Beeswax Moisturizing Night Creme! It's almost impossible to find a product that just moisturizes. I don't need sunscreen and 30 thousand other chemicals slathered on my face while I sleep. I just need my skin to be babied from all the day's stresses. The Night Creme is perfect! I'm so in love!" 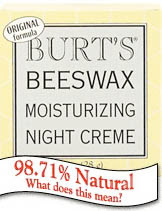 Still another had this to say of their Tinted Moisturizer: "I am a longtime fan of Burt's. Frankly, I haven't tried a product yet that I didn't like. 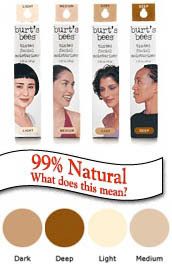 In fact, I recently purchased a tube of your Burt's Bees Tinted Moisturizer. It is exactly what I was looking for! Thanks a lot!" These all sounded interesting to me & the praise they've received sounds promising. Have any of you, my readers, tried any of these? If yes, what do you think of them? I want some 2nd opinions, so I know if I should try these or not.